I have been looking at and cooking healthy recipes for the past several years. I finally decided to try something new – create my own. 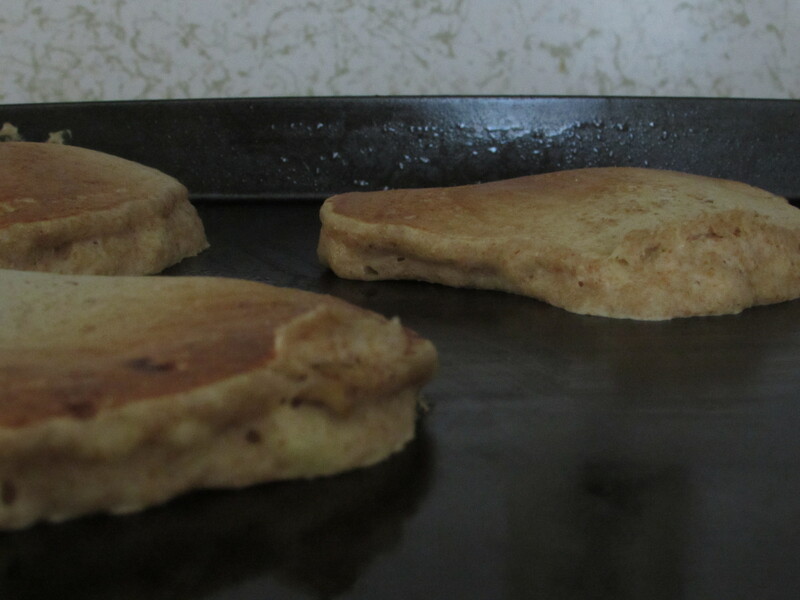 So, I bring you my first original recipe – Banana Split Pancakes! These are great for serving that special someone breakfast in bed! Combine milk and lemon juice. Set aside for about 10 minutes. This creates a homemade “buttermilk”. Mash bananas or puree in a blender/food processor. Combine bananas, eggs, vanilla, and “buttermilk” in a small bowl. Mix well. In a medium/large sized bowl, mix flour and baking powder. 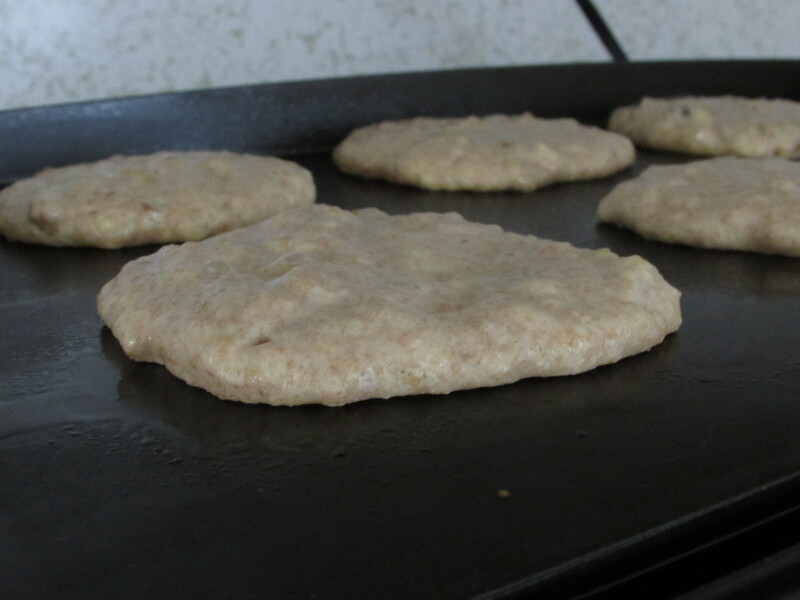 Create a well in the center of the flour and pour the banana mixture into the center. Add walnuts. Stir until just barely combined. 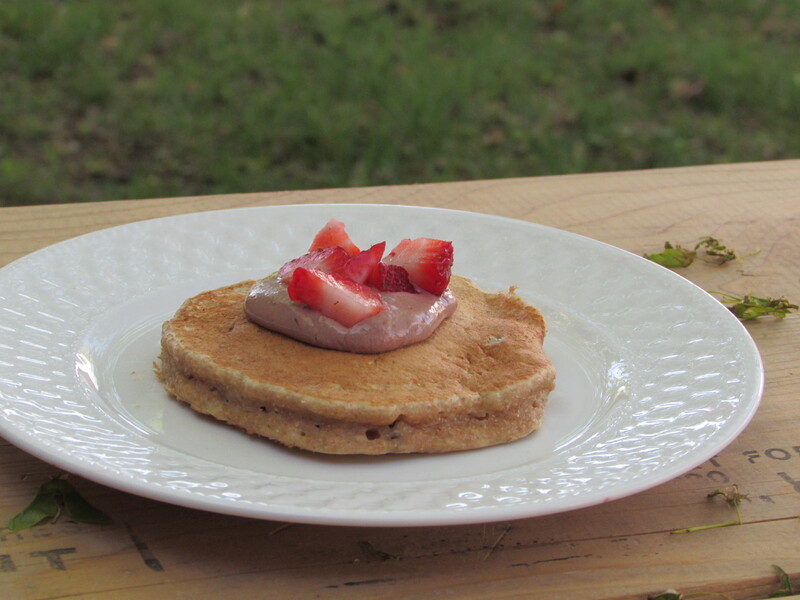 Pour the pancake batter in scant 1/4 cup servings onto a greased griddle or skillet using medium/high heat. Using the measuring cup, spread the batter out until about 3-4″ in diameter. Once bubbles start to appear on the the top, flip the pancake (do not overcook). Topping: Combine greek yogurt and cocoa powder. Stir until well combined. Place desired amount of topping on pancakes. Add chopped strawberries. My family has had these for breakfast and dinner, and it is a big hit. There are rarely any leftovers, and I don’t feel bad giving the “topping” to my kids the next day as a snack. So sit back and enjoy this “dessert” at any meal! This post was featured on Jebbica’s World. I’m definitely going to be trying this recipe. 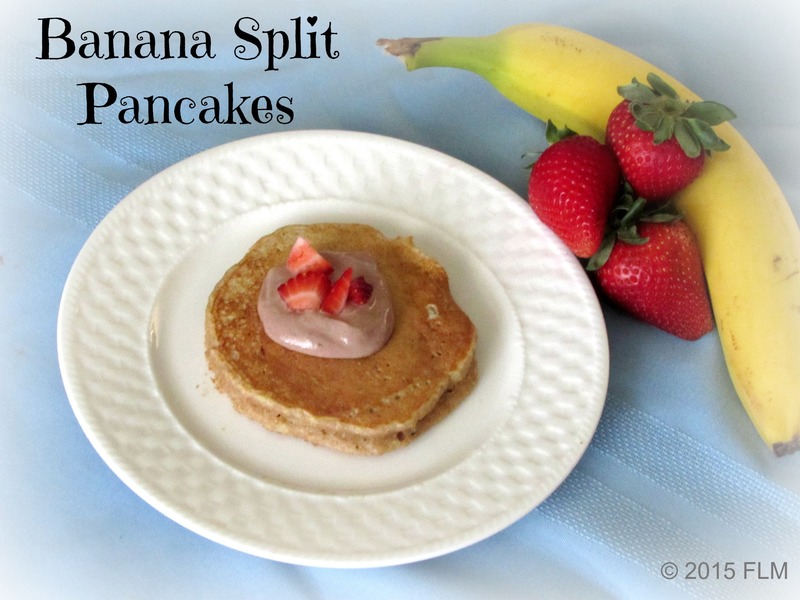 My family rarely eats breakfasts like this, but we love breakfast for dinner, so we will definitely be giving these a try! I love breakfast for dinner too! Be sure to let me know how they turn out! Ooh, those look so good! And healthy, too! I’m going to pin this and try to make them later! Thanks for stopping by my party! These are good (even if I do say so myself!). If you want to try making them even healthier, I have on occasion replaced one of the eggs with chia seeds. Kids didn’t even notice the difference, and got some more Omega 3s!